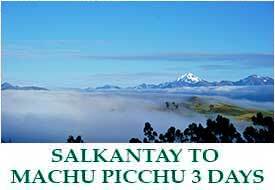 Salkantay Trek To Machu Picchu 3 Days Tour. Salkantay route is on its way to become one of the most famous across the world due to its ample geography and bio diversity of flora and fauna, this route goes through Humantay and Salkantay high mountains as well as beautiful turquoise colored lagoons which seems surreal. Following the mountains, the visit to Santa Teresa tropical valleys will come. Here our peasant brothers from these towns are dedicated to cultivate coffee and more other fruits as passion fruit, oranges, papayas, bananas and honey bee farming. Our visitors will have the opportunity to visit some local families to share a little bit of our culture and also interact with local people, tasting some exotic beverages and traditional food, especially the fresh avocados. 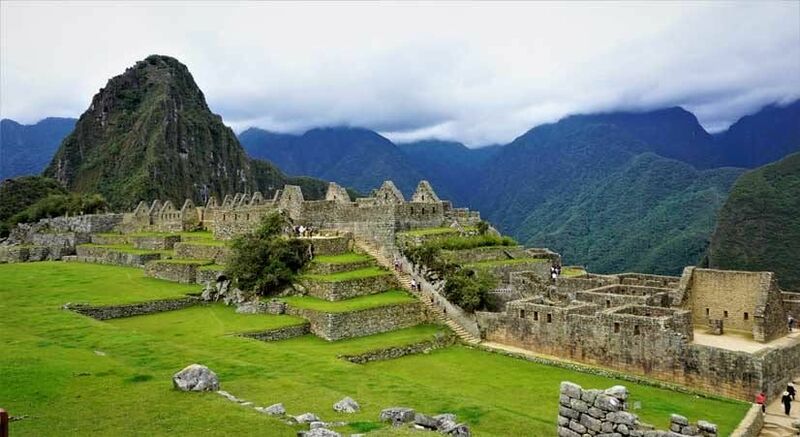 Once we had accomplished our visit to this impressive place, our service includes the train service to reach Aguas Calientes town after a great adventure to finally finish at Machu Picchu inca citadel considered a worldwide wonder. Similarly, you will return back to Cusco at comfortable expedition train class and private transport to cusco. 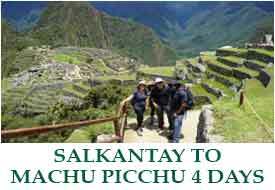 What does Superior Salkantay service include? Bottle wine in the campsite. 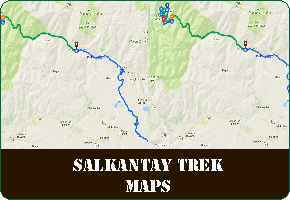 Entrance fee ticket to Salkantay trekking route. Private transportation from Cusco until starting trekking point. 01 emergency riding horse in case our clients feel very tired or to take photos. The begin of this adventure is in Cusco city, picking you up from your hotel approximately at 04:30 am by our professional adventure guide and our private transportation, for a short ride to Mollepata town (2 hrs.) Upon or arrival, we will stop some time to have our first breakfast and use the restrooms, afterwards we will continue through some hours until reach Soraypampa and from here we will initiate our hike with impressive views of Humantay and Salkantay mountains. This first portion of the hike is gradually ascending towards Salkantay mountain and through a very ancient path until reaching Salkantaypampa, called this way due that it is located on the foothills of Salkantay snowcapped mountain. Then, we will continue until reach the summit of this road, Salkantay Pass in which we will have stunning views of surrounding mountains and appreciate the tropical forest valley. Later in the afternoon and after a nutritious lunch, we will start descending on foot for 2.5 hrs until reach our campsite and enjoy your hot shower (we provided towels) then take a relax time to share with our staff members, as well as appetizers and dinner. Day 02: Wayraqmachay – Colpapampa – hidroeléctrica – aguas calientes. We will start this day with our special service to tent and a hot coca tea which is good for the altitude, and then you will have breakfast in our dining tent. After breakfast we will continue descending to the valley and will enjoy a lot of wildlife as many types of orchids, varieties of trees, bamboos, different types of wild birds and moreover! Then we will reach to Colpapampa village, here we will have a break for lunch. In the afternoon, continuing with our adventure we take a minivan for 1 hour approximately and then we get to hydroelectric form where our clients Will board the train to aguas calientes and then your guide Will help you to get your hotel and then dinner at a restaurant in aguas calintes and rest for the Machu Picchu day. Climate: Sunny during dry season. Very humid and rainy during rainy season. This day we recomended to wake up very early to try to get one of the first buses to reach Machupicchu and enjoy the wonderful sunrise over it as it is a unique experience. After that you will have a private guided tour by our profesional guide which will lasts 2.5 hours and a lot of inca history about our Inca culture, considered one of the most important in South America with an ample extension in this south America continent. Once you had finished your tour and taking the beautiful Machupicchu postal photo, you will have time to relax and have the visit to some important places like Huayna picchu or Machu Picchu mountains (we advise you to request the ticket at booking time) or walk to Sun Gate, or Inca bridge in Machupicchu. Following your experience, for your return you will board the bus back to Aguas Calients and then from here you will board expedition class train at 14:55 pm back to Ollantaytambo train station; upon your arrival, our transfer will be waiting for you to return back to Cusco city and your respective hotels, arriving by 18:30 pm approx. Transportation:, bus to Machupicchu, train to Ollantaytambo, touristic minivan to Cusco. sakantay trek 3 days group service price: $ 499 USD per person. We need 2 people minimum to open this tour if you are two we can do it! Our price $ 550 USD per person for 3 people. Our price $ 550 USD per person for 4 or more people.